Because of the scriptwriters' strike from January to March 2008, this season contains only 18 episodes, the last episode being a double episode. 1 BURY YOUR DEAD (no. 95) - The NCIS team discovers the shocking truth to the biggest secret of last season. The final showdown between the NCIS team and an elusive arms dealer reaches an explosive and deadly conclusion. 2 FAMILY (no. 96) - The team is trying to find out who killed a Petty Officer and a young woman. The matter complicates when a baby is involved and goes missing. During an autopsy, Ducky makes a startling discovery that turns a murder of a Petty Officer into a search for a missing infant. Meanwhile, Tony has to deal with his feelings for Jeanne. 3 EX-FILE (no. 97) - Captain from Defense Intelligence is found dead in his house by his wife and her friend. The team has a few leads right from the start. It gets interesting when one of the suspects has an interesting connection to Gibbs. Abby gets help from a 'cyber' from the DIA. Things become complicated for Gibbs when a witness in the case turns out to be his ex-wife. 4 IDENTITY CRISIS (no. 98) - The team investigates a dead John Doe when Ducky discovers the man has been killed instead of just died. It soon turns out he was involved in shady business: identity erasing and such. Ziva bonds with a woman after initial awkwardness. When Ducky realizes that one of his cadavers used for researched is actually a victim of murder, the NCIS team identifies him as a criminal genius who is capable of deleting the past. 5 LEAP OF FAITH (no. 99) - The team investigates the murder of a sailor recently back from the Middle East on live television. A Navy Lieutenant is murdered, and he's suspected of having ties to terrorists. The Team investigates together with an analyst who was working his case. 6 CHIMERA (no. 100) - While investigating a mysterious death on a top-secret naval research ship at sea, the NCIS team comes upon an abandoned ship which contains a deadly secret that may cost them their lives. The Team is choppered aboard a secret Navy vessel after a mysterious death of one of the crew members. Jenny takes on a fight against the commander of the mission the ship was on. Ziva is getting more and more acquainted with movie vernacular, to the delight of Tony. 7 REQUIEM (no. 101) - When Gibbs agrees to help the childhood friend of his daughter, who died 15 years ago, he finds himself at the center of an emotional and soul searching journey into his past, which leads to a shocking and heart-stopping conclusion. Gibbs finds himself emotionally challenged when he agrees to investigate a crime connected to a friend of his daughter, who passed away years ago, and the investigation leads to a shocking conclusion. 8 DESIGNATED TARGET (no. 102) - A cab is racing to get a Navy Admiral to a meeting. Then the cab is shot several times by gunmen. The driver and the Admiral are killed. NCIS is brought in immediately to find out if the Admiral was targeted. The NCIS team's investigation into the assassination of a Navy Admiral takes an unexpected and emotional turn when they meet a woman searching for her missing husband, a political refugee from Africa. 9 LOST AND FOUND (no. 103) -The NCIS team plays babysitter to a 9-year-old boy whose father is wanted in connection with a cold case murder. Their search for the man, a trained survivalist, leads them into the wilderness where they discover the startling truth about his past. 10 CORPORAL PUNISHMENT (no. 104) - Marine Corporal with PSTD (Post Traumatic Stress Disorder) breaks out of a hospital and the team investigates. The team gets involved and finds out that someone is messing with his mind. While trying to track down a delusional and violet Marine who thinks he's still in Iraq, the NCIS team will come to a realization that the man is a subject of a secret experiment, but not without a high price to pay. 11 TRIBES (no. 105) - A young Muslim Marine is murdered near his Mosque. His father is the Imam there, so the team go to talk to him first. 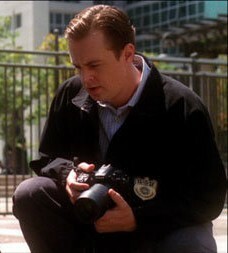 McGee finds out the FBI is involved when he finds a bug planted at the Mosque, when he's there to plant one himself. Ducky refuses to perform autopsy due to his religious beliefs, so the NCIS team tries to talk to the father of the deceased. 12 STAKEOUT (n° 106) - A prototype radar system is stolen out of the hands of NCIS. Meanwhile, a man is murdered while NCIS is taping surveillance footage for another case. The team investigate if and how the cases are connected. Tony must work with D.C. homicide detective Andrea Sparr. At first, they clash when he undermines her case but they eventually patch things up and sparks fly. 13 DOG TAGS (no. 107) - When a dog owner is found murdered the NCIS team must determine if his dog committed the murder or not, and Abby decides to fight for the dog's life by proving trusting her instinct about the dog's innocence. Meanwhile, Gibbs learns about Jenny's secret. 14 INTERNAL AFFAIRS (n° 108) - When the dead body of arms dealer La Grenouille surfaces, the NCIS team is put under investigation for his murder by the FBI and Jenny Shepard becomes the prime suspect A new recurring character, FBI Special Agent Wentworth, will be tasked with watching over the team during the investigation. 15 IN THE ZONE (no. 109) - A war zone may provide good coverage for murder, but the NCIS team is quick to realize that CAPTAIN John Rankin was not simply the random victim of a mortar attack. Soon Tony and Nikki are making their way to Baghdad to find out what really happened, and why. 16 RECOIL (no. 110) - The team hunts a man killing unfaithful wives. Ziva goes undercover to find the murderer of several women of Navy personnel who had an affair. Gibbs, McGee and Tony help out. 17 ABOUT FACE (no. 111) - Jimmy Palmer becomes the target of a mysterious killer who only he can recognize : he finds himself staring down the barrel of a gun. 18 JUDGMENT DAY (Part 1 et 2 (no. 112 & 113) - Two boys discover a dead man when they are messing around with a BB-gun. It turns out the man is a former NCIS Special Agent William Decker. Director Sheppard attends his funeral, with Tony and Ziva tagging along to protect her. Agent Decker's autopsy was ruled a suicide, but at the funeral, Jenny discovers it was murder. Mike Franks is also in this episode and knew the agent. During her investigation the team will have to deal with the loss of one of their own. Mike Franks is doing research on behalf of Gibbs. Gibbs is in Jenny's house, while the team and Vance are back at NCIS Headquarters. This season 6 contains 25 episodes (instead of 24 usuals). Shooting begins on July 2, 2008, finished on April 17, 2009. The broadcasting of the season premiere on CBS was September 23, 2008. 1 LAST MAN STANDING (no. 114) - The murder of a Naval Petty Officer leads Gibbs to uncover a shocking connection between the case and Director Vance's decision to disband his team, a member of Gibbs team will not survive the episode. The surprising secret behind Director Vance's decision to split up Gibbs' team is revealed. 2 AGENT AFLOAT (no. 115) - While stationed on an aircraft carrier, DiNozzo finds that a Navy Lieutenant's apparent suicide by jumping overboard may be connected to a larger, deadly scheme. 3 CAPITOL OFFENSE (no. 116) - Gibbs and his team investigate the murder of young Navy officer with ties to the U.S. Senate. When the young female Lieutenant Commander's body is discovered, shot in the back, suspicion falls on a prominent U.S. Senator who served in the Marines with Gibbs. 4 HEARTLAND (no. 117) - A Marine gets in a brawl inside a bar. When the bouncers kick him out, he finds two Marine buddies barely breathing between the trash cans. One doesn't survive and the team is called in to investigate. Gibbs goes back to his home town, where we meet his father. 5 NINE LIVES (no. 118) - Gibb's team is investigating a murder of a Marine that took place in his garage. Some finger prints of the former chief of the murdered member unit, are found on the murder scene. However, this Marine is the main witness in the trial of an alleged murderer, in an investigation leaded by the FBI and the FBI Agent Thobias Fornell. 6 MURDER 2.0 (n° 119) - During the week of Halloween, a murderous psychopath forces the team to play a deadly game of virtual Cat and Mouse and leaves videos clues to the next victim's identity. Ducky makes a startling discovery when he performs an autopsy and finds a killer has left a roll of parchment in the victim's mouth inscribed with an internet address. 7 COLLATERAL DAMAGE (no. 120) - A Quantico navy bank has undergone a hold and the NCIS is responsible of the investigation. A new recruit, Dwayne Wilson, joins Gibbs' team to help solve a bank robbery at Quantico, during which a security guard was shot dead. Ghosts of the past come back to haunt Gibbs as the team investigates a deadly bank robbery and he begins to second-guess his own judgment. 8 CLOAK (no. 121) - A strange delivery in a box arrived at facilities Navy: The delivery driver and a navy MP officer discovers that is a sailor'corpse. Gibbs and his team investigate. A shocking revelation comes to light after the team is forced into playing a dangerous war game. That leads to real very consequences for one team member. With Gibbs' suspicion levels now off the scales, Director Vance allows him the resources to find the mole infiltrating the department. 9 DAGGER (no. 122) - The team must rely on information from some questionable individuals to stop a criminal bent on stealing government secrets. They work to discover the root of the mole in their department, leading to disaster as someone makes the ultimate sacrifice. 10 ROAD KILL (no. 123) - The team investigates the death of petty officer Greg Collins, an underground ultimate fighter who died after his car was chased off the road on the way home from a fight. 11 SILENT NIGHT (no. 124) - Washington police are on a robbery case where two old people were also killed. The lead police detective, a DiNozzo's old friend, called the NCIS since fingerprints of a veteran petty officer have been found on the crime scene. But this Marine is supposed to be dead since the 90's. The day before Christmas, preparations for celebrations have to wait ; Gibbs and his team have 24 hours to solve the case. 12 CAGED (no. 125) - The NCIS investigates the murder of a Navy Lieutenant, whose body has been recovered while he was gone for over ten years. Ducky shows the lieutenant was killed with the same M.O. that a criminal incarcerated recently: stabbed and fingers cut off. Agent McGee is responsible for interviewing the prisoner. The team is forced to uncover the truth behind the murder of a guard after a women's prison riot traps one of their own and McGee is held captive. 13 BROKEN BIRD (n° 126) - Gibbs and the team are called for the murder of a petty officer, close to his home. While Ducky and Palmer take care of the sailor, an Afghan woman calls out et stabbs Ducky by accusing him of war crime. We'll know some painful things about the young Dr. Mallard. 14 LOVE AND WAR (no. 127) - Captain Thomas Jennings was reported missing by his daughter: he didn't go at the restaurant as originally planned. The body of the captain is quickly found by the sheriff and the NCIS is called to discover his murderer. Everyone is suspect: the Cuban housekeeper, his colleagues working laboratory of the Navy, his daughter and her boyfriend. 15 DELIVERANCE (no. 128) - A Marine was found dead, where he grew up, by young people playing with firearms. The NCIS investigates on this man who had a past in Latin gangs. Two Marines, former gang members are suspected. One will remind Gibbs of painful memories: There are eighteen years in the Colombian jungle, the mother of this soldier saved Sergeant Gibbs injured. After having hidden and treated, Gibbs was able to escape the Colombian drug cartel. Mike Franks will help the Team in this case. 16 BOUNCE (no. 129) - A Navy Lieutenant is found dead in a large suitcase in a luxury hotel. But the lieutenant had been the witness in a NCIS investigation when Tony was the leader of the team some years ago. Gibbs gives the direction of the investigation to Tony. 17 SOUTH BY SOUTHWEST (no. 130) - While working on a case, an NCIS special agent is murdered in the same way as a businessman of Arizona, the native region of the agent. The only clue is a painting send to the Gibbs team, just before dying. The investigation will lead Tony and Gibbs in Arizona while the rest of the team will work on painting and the search for the assassins. The uranium will be at the center of the case and Gibbs will use his talents as a sniper to avoid death. 18 KNOCKOUT (no. 131) - Chicago, a former African-American boxer is murdered. The past is catching up Vance. This man is an old friend of the NCIS director. In this episode, we discover the family of Leon Vance and his past as a boxer in Chicago. Leon will be assisted by a part of the Gibbs team to make an informal investigation at Chicago. It will return with his past when he worked alongside a boss of organized crime and try to find the murderer. 19 HIDE AND SEEK (no. 132) - A revolver was found in the affairs of a teenager 12 years old, son of a lieutenant commander in the Navy. Gibbs and the team is dispatched to know the weapon's origin. But this seems to be complicated when Abby found blood on it. Finally, the boy accused his father to have killed a chief petty officer of the Marine who threatened him. 20 DEAD RECKONING (no. 133) - While Trent Kort is hurt in a shooting during a transport of witness / prisoner, he will ask of the help Gibbs. Indeed, some weeks ago, Trent had supplied him the file of Vance. Gibbs will thus have to he "return the favour". Originally, this episode was called "Payback". 21 TOXIC (no. 134) - An army labotary works on a new disease which affects American soldiers who just come back from Afghanistan : "Afghanistan syndrome". But a PFC, labotary patient, is found dead while the doctor, who is working on the cure, has vanished. The labotary and the FBI call on Abby to finish the genetic researches. Meanwhile, Gibbs' team is trying to resolve the murder. 22 LEGEND (part 1, no. 135) - This double episode introduces NCIS spin-off characters "NCIS Los Angeles". Gibbs' team is inquiring on a Navy PC's murder. Two brothers quickly arouse suspicion. The investigation, led by another NCIS team, meets up a case of arms traffic. (Assault rifles, C-4 explosives...) Gibbs, McGee, Tony and Ziva will travel to collaborate with the special agents Alexis Callen, Clara Macy, Nate “Doc” Getz, Lo Kensi, Sam Hanna and Dominic Vaile. 23 LEGEND (part 2, no. 136) - Gibbs' team is working in co-operation with the in-charge team of the arms trafic. Meanwhile, Alexis Callen is still undercover to dismantle it. The investigation is about to take a turning point when NCIS realizes that a Mossad Agent impersonates an arms dealer. 24 SEMPER FIDELIS (no. 137) - Crisis meeting in the SECNAV offices, the Secretary of the Navy Phillip Davenport invited the CIA director, the assistant secretary of ICE and the FBI director to a poker game. At this meeting under hight surveillance, an ICE agent is killed. The Secretary of The Navy Phillip Davenport will impose Gibbs and his team to lead the investigation, Agent Fornell and agent ICE (Immigration and Customs Enforcement) Julia Foster-Yates will assist the NCIS, to find the killer. The team find their investigation leads to a familiar foe. Meanwhile, Tony finally comes face-to-face with Michael Rivkin. 25 ALIYAH (no. 138) - The aftermarth of DiNozzo's confrontation with Michael Rivkin, Ziva's homecoming to Israel with Gibbs and the team leads to a tense reunion with her father, the enigmatic and powerful head of Mossad. As tensions rise, Gibbs is forced to make a decision that sends shockwaves through NCIS.